Guys, can we take a moment here and check out my progress? There are 15 cupcake recipes in the Hummingbird Bakery Cookbook. I've cooked through 8 of them, and I'm on my 9th recipe. I'm more than halfway through! Looking the remaining recipes, I'm only interested in a handful -- that is, everything from number 9 to 12, highlighted in red. The others, not so much. I've never been a fan of pumpkin baked goods, so I really don't want to recreate that at high-altitude. You all know that I hate marshmallows, despite the fact that they're incredibly useful for decorating cupcakes. Ginger goods tend to be hit-or-miss for me, and, after reading through the Hummingbird Bakery Cookbook's recipe and realizing that their recipe uses an ingredient that's pretty hard to find (ginger syrup), I decided that it wasn't worth adapting for high-altitude either. So really, I've only got about 4 cupcake recipes to cook through before I declare this project done. Yay! Don't fret -- I have other baked goods in store for you guys. After looking through my Recipe Index, I realized that my Cookie section was particularly lacking. I definitely want to improve upon that. And I really haven't used my KitchenAid Mixer's ice cream maker attachment too much -- with the weather in Denver reaching the high 80s nearly every day, that definitely needs to change. So back to our regular programming. To be honest with you, I wasn't particularly thrilled about this recipe. Coconut and pineapple sounded like a combination of flavors that was too much for me. Growing up in the Philippines made me a little bit of a tropical fruit purist. Fruits in the Philippines were so delicious on their own (seriously, Filipino mangos are the best in the world). Why bother mixing and matching when the flavor of one was more than enough? 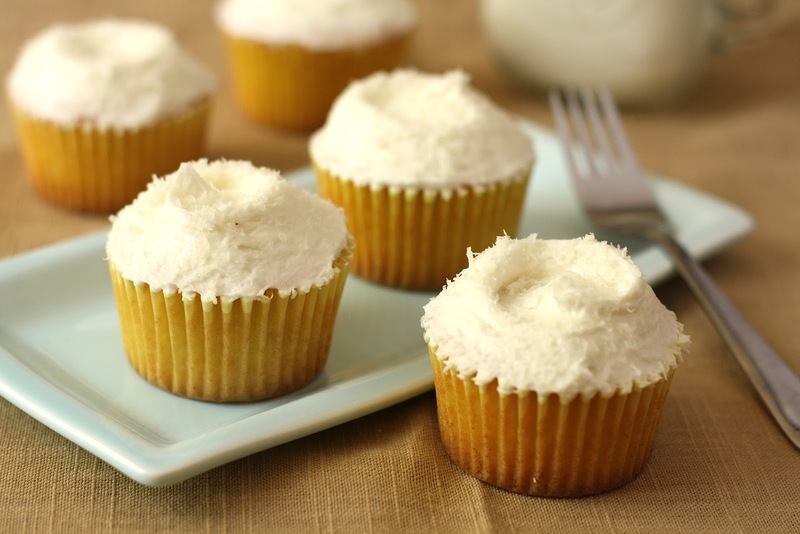 Pure coconut cupcakes -- that is, just coconut cupcakes without any pineapple pieces -- that's something I'd be willing to fully support without question. But a quick look at the recipe for Hummingbird Bakery Coconut and Pineapple Cupcakes told me that this was a recipe worth trying. The cupcake recipe is almost identical to the cookbook's recipe for vanilla cupcakes -- meaning that, in accordance with the mother recipe theory, I could just use the alterations that I used for the vanilla cupcakes. The only difference was the addition of pineapple pieces and the use of coconut milk instead of regular whole milk. I don't know about you guys, but I love coconut milk more than I love actual coconuts themselves. I was curious to see how this substitution would pan out. And boy, was I glad that I did! These were the most fragrant and delicious-smelling cupcakes that I've ever baked. Our entire apartment smelled like toasted coconut during the baking process. The cupcakes themselves were light and delicious, with the coconut milk infusing the cupcake full of flavor. The pineapple pieces in the cupcake crystallized and caramelized during the baking process, giving the cupcake a slight tang. Stay tuned for the final recipe, folks!